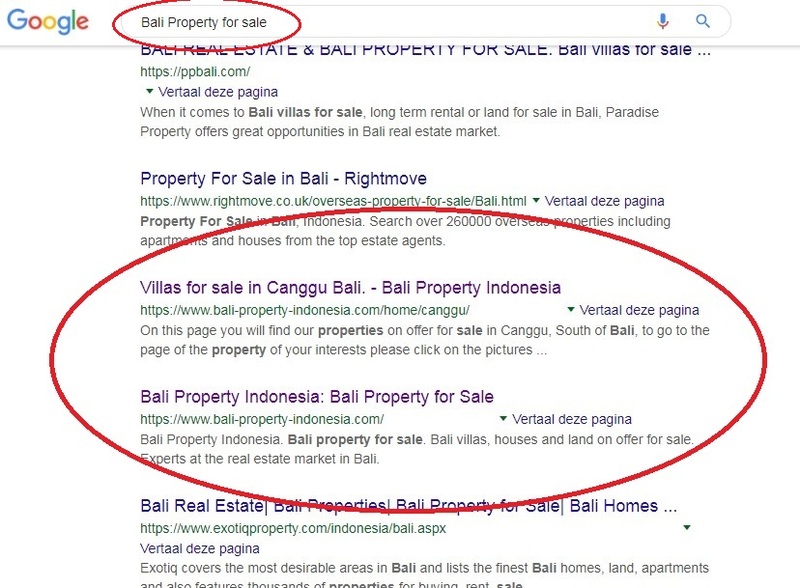 You probably will be quite surprised to read this on our website, our website which purpose it is to sell your property as an agent, although we work for a, in Bali, commonly known and charged 5 % fee. But how if you can save this 5 % agent's fee and for example lower your property in price because of these savings and increase the chances of selling your property, so you could put up a more competitive price tag on your villa, house or land. 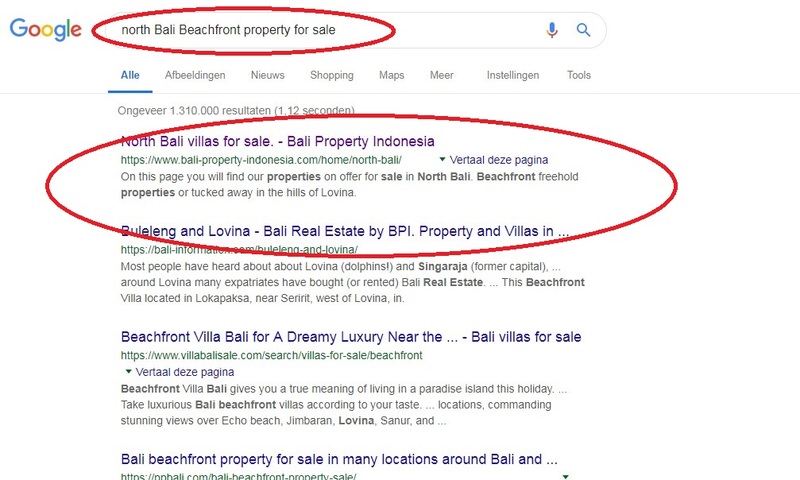 We as agents decided quite some time ago that we do not cover the whole of Bali anymore. Due to an increasing numbers of traffic on the road which only takes or more and more time to travel to a property to discover that our potential clients are finished after a 10 minutes inspection. So we decided to still serve our potential clients that want to sell their property but for us just too far. However we are open with this unique concept to all property owners that want to sell their house, villa or land. 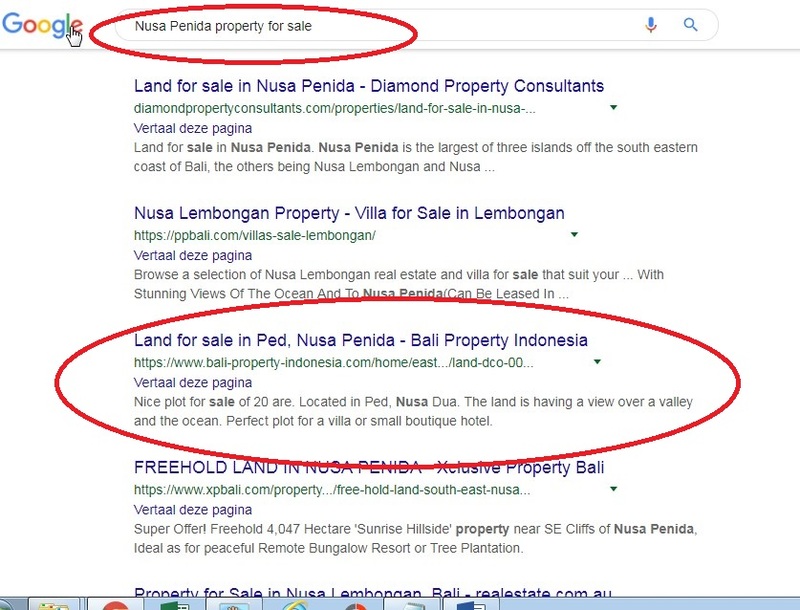 What do you need to expose your property on the real estate market so your villa/house or land gets enough attention from potential buyers….??????? What you need is a good ranked website on the main search engine like Google…..!! 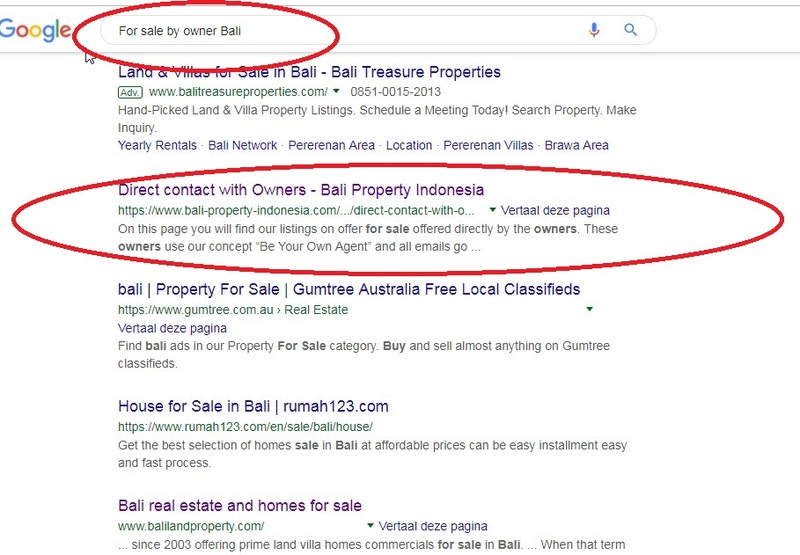 And here is the trick, many real estate/property agents (you probably know the big companies and names) only use their websites to advertise their enlisted properties and hope that every now and then a potential client send an enquiry or shows up. Basically compare it with fishing in a fish pond. 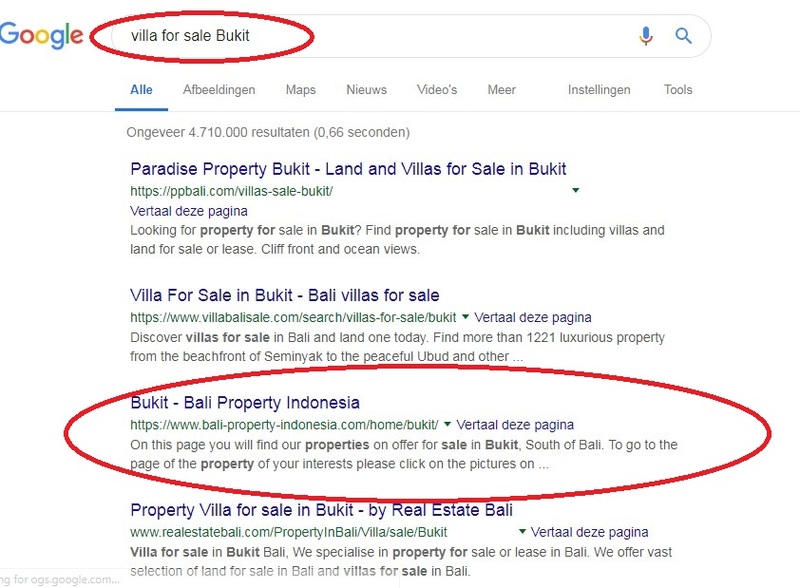 The agents invest some money (like adverts on Google and SEO optimization companies) to rank their website high in the Google rankings so potential buyers will end up at their website because it is on top of the list. But we know out of experience the more serious buyer skips these websites on top of the list. But do you have the time to make a website and every day updating it, spending money on it so Google will rank it on top of the list.......no, you don't. 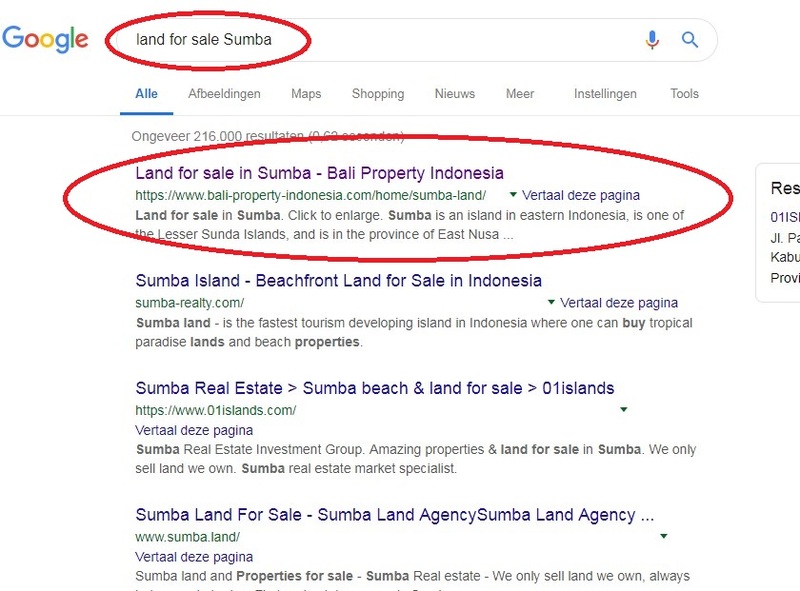 Only if you knew that invest money on Google adverts isn't enough to rank your website high on Google, the history of a website is also important and many more details like SEO. 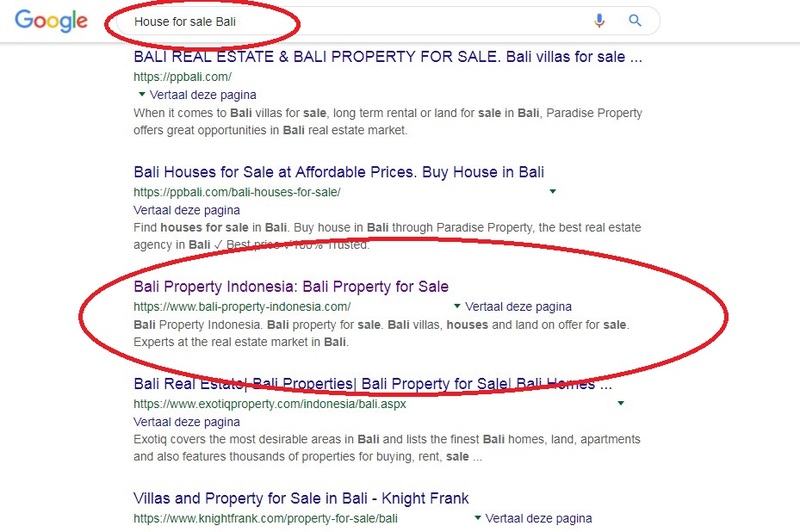 For you it is important that you only want to expose your property to sell, so what you need is to advertise your property on a good website ranked high on Google. The property agents are happy to list you on their website and charge a 5% fee after a closed deal. Your property is just another bait on their fishing hook to fish with. 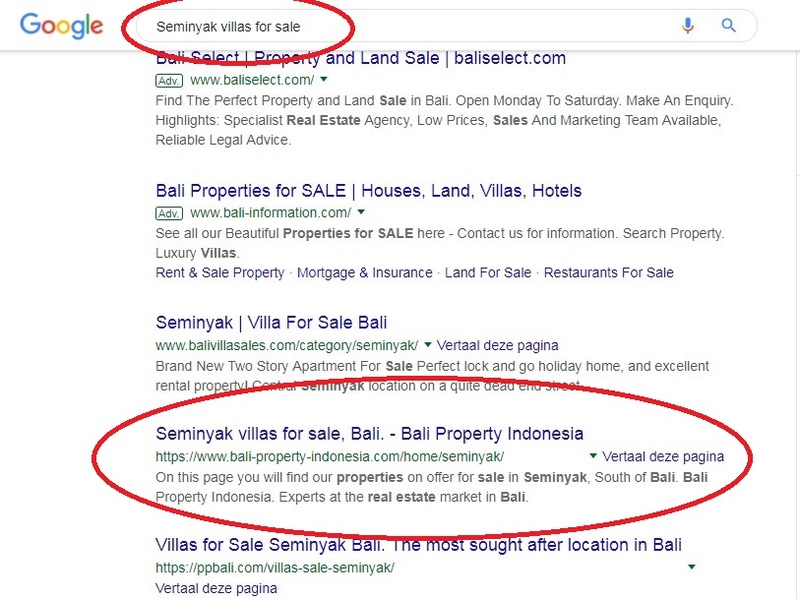 And now we bring you the solution to sell your property and save you the agent's fee............. We give you the opportunity to place your property on our, on Google, good scoring and ranking websites and that is all you need to make the sales price of your property more competitive than other properties for sale in Bali, because you save a 5% of the selling price. And you increase your chances to sell. 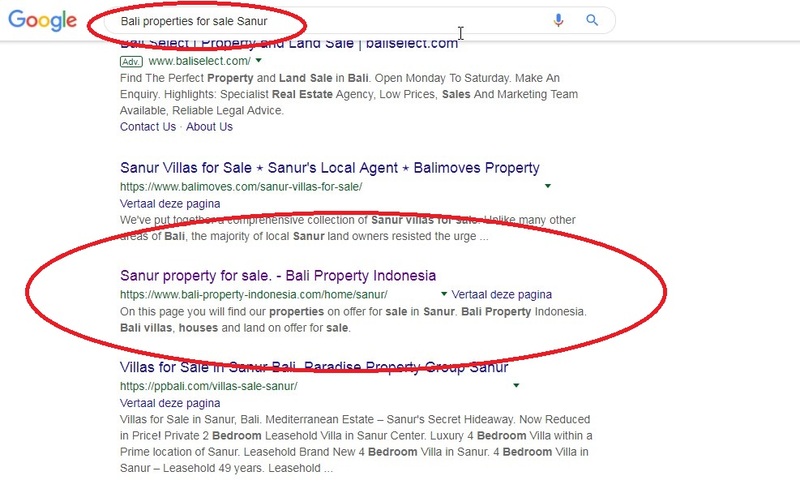 Our website have a long history on the Real Estate/Property market in Bali. We invested a lot of time and efforts to optimize our appearance on Google. We don’t pay on adverts to obtain a high position but we used organic keywords and most important, we played by the rules of Google. 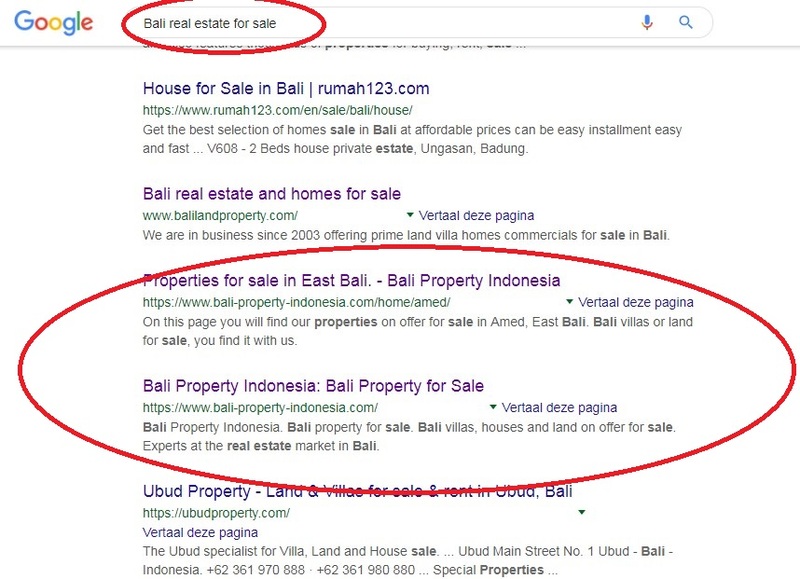 We never handed our websites over the famous SEO companies that promises you high rankings within weeks and after six months Google will notice the tricks these companies use and a bad evaluation of the website is what follows and the website will plunge down on the Google list. 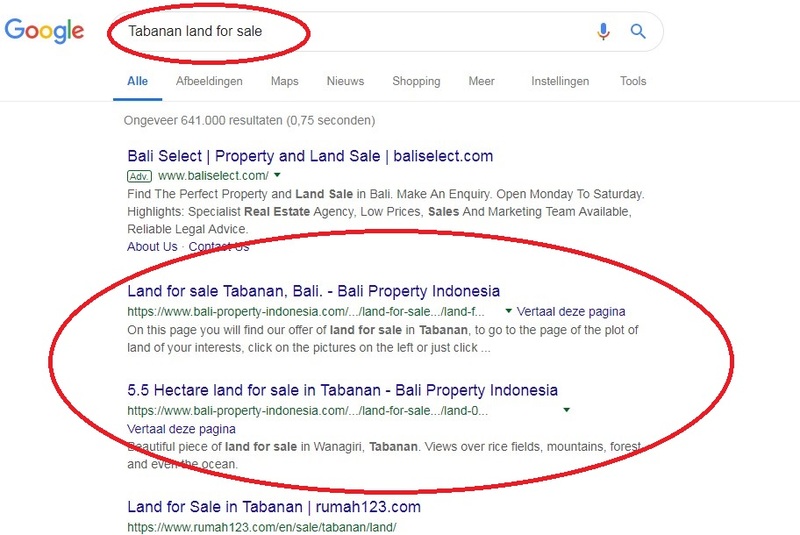 We assure you that all the results here below is on the first page of the most important search engine Google, we do no not use "adverts" or other tricks to obtain a high ranking. 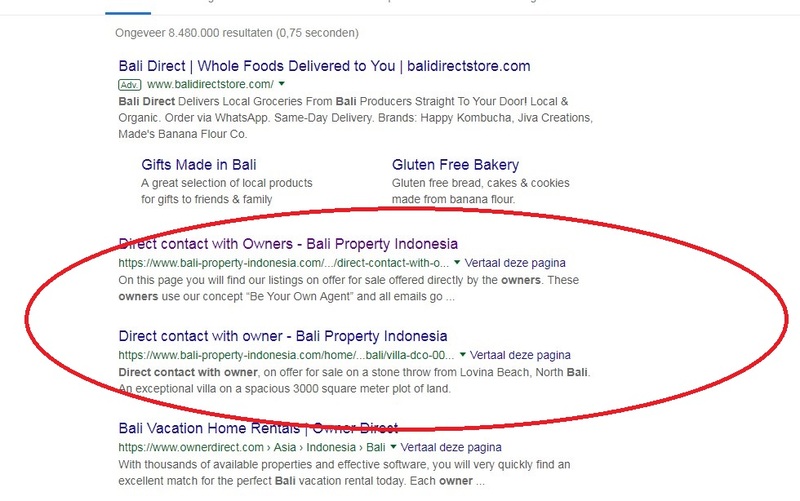 We purely use so called "organic search results" to obtain a high ranking. As you can see in the picture above thousands of visitors each month with a reasonable bouncing rate of 45% which 65% up to 70% is an average. ( the lower the percentage the better the score). 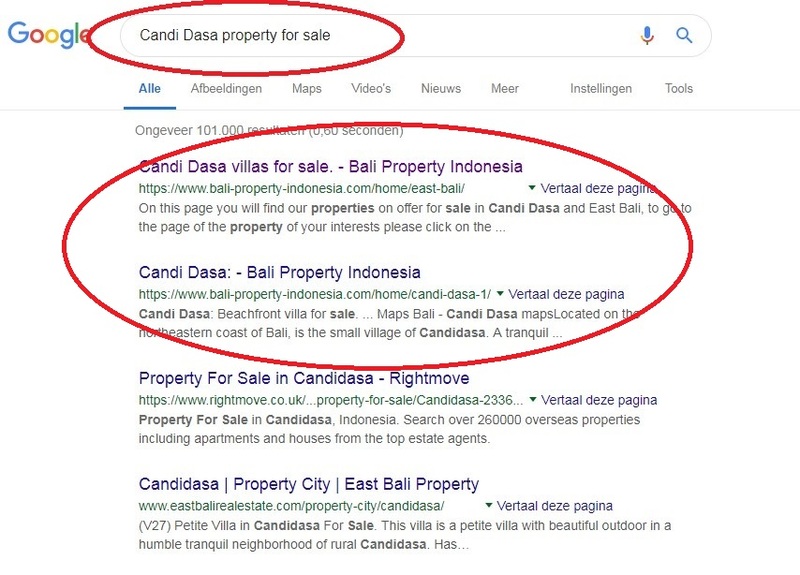 Now you will ask yourself if it is really possible to list your property with us and you are not obligated to pay the common 5% agent's fee here in Bali. Yes, it is possible. What we offer is that you can list your property on offer for sale on our website, just like the other properties for sale we have on our site, your property won't look different like one of our 'agent properties'............ 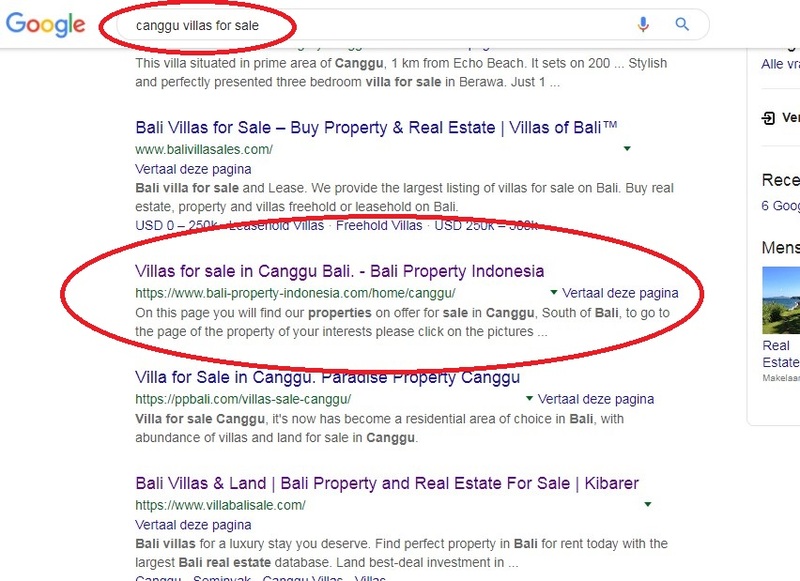 The big and huge difference is that on your page of your listing there will be a contact form and by using this contact form the potential buyer can contact you and only you can communicate with this potential buyer to make further appointments about, for example, a visit to your property for sale, we will and cannot or do not interfere in your communication with your potential buyer. Because simple as it is, you use your own private email account. You can promote your property yourself too. 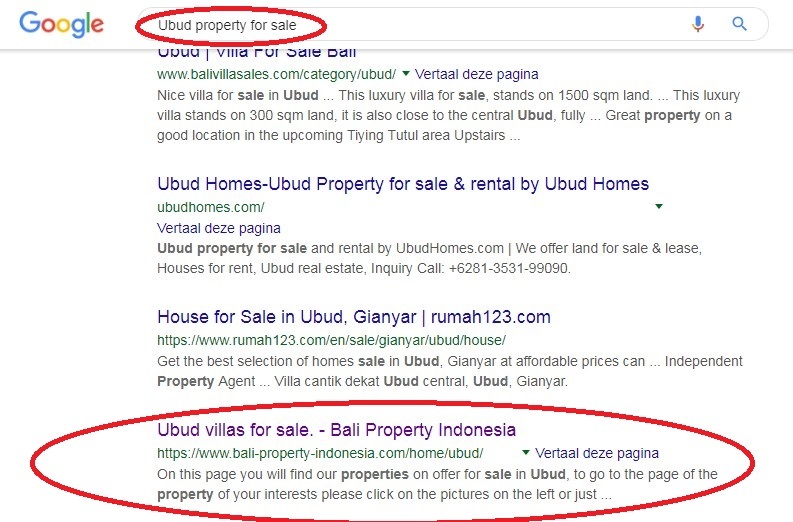 Use the link of the page of your listing and promote this on social media. Copy the link of your property and paste this in your Facebook, Twitter, Google+, Linkedin or other social media platforms. This is a simple way to draw attention to your own property and hopefully this results in various requests. You have to contact us so we can send you a link you have to fill out with details about your property you want to sell. This will take you five minutes. Together with these details you can send us up to maximal 40 pictures of your property. Also important is that you make a promotional text about your property that we can place on your desired page on our website. Yes, there are costs, but not to compare to the 5 % agent's fee. 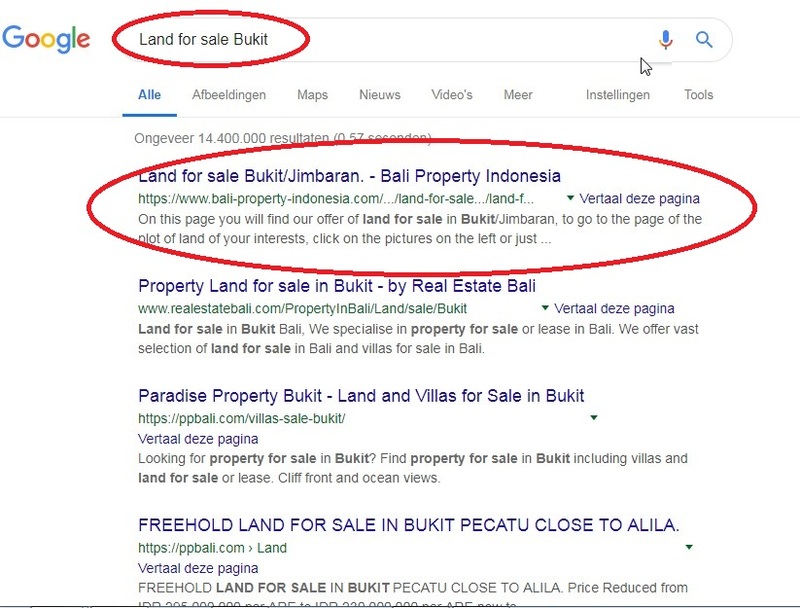 The costs to place your property on our website is 3.000.000 Rupiah for one year appearance on our website. 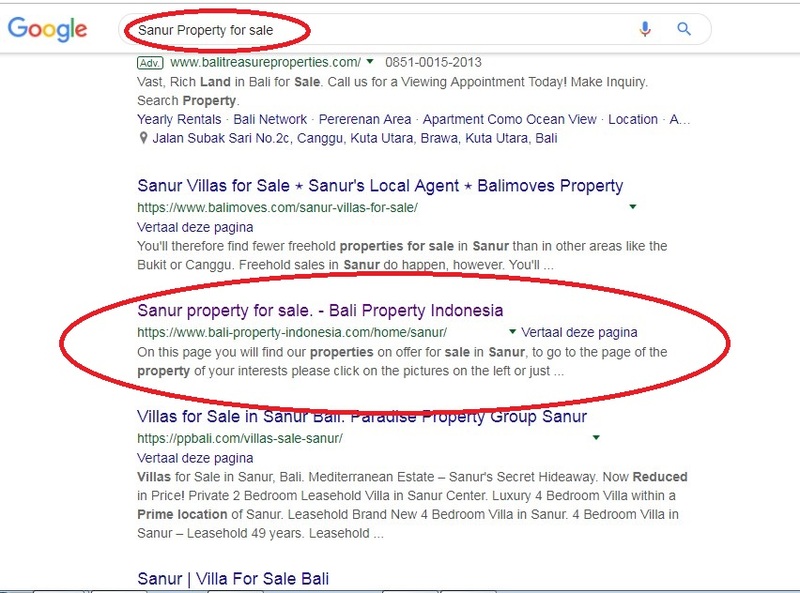 After placing your property on our website, you and only you are in control, you can even check this from time to time by just go to your page and send yourself an email, so you can verify that only you receive the emails send from your page on our website.